A dazzling array of pure beam Sharpys, rigged in a magnificent two-tier array around the Oslo Spektrum Stadium and pointing directly at the audience, added superstar sparkle to the final of Norwegian Idol. 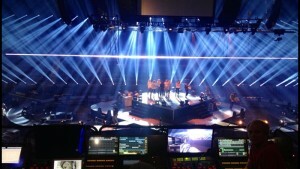 Lighting designer, Anders Busch, specified a host of Sharpys for the closing show of the international TV show phenomenon. 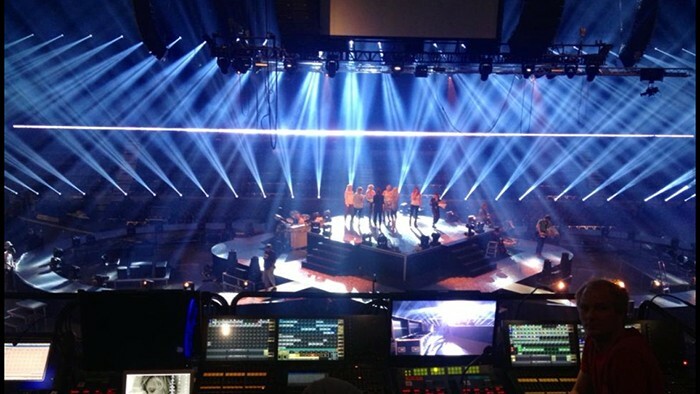 "The concept for the Norwegian Idol finale 2013 was that it should not look like every other TV talent show," explains Petter Nilssen from lighting equipment supplier, Elektrik Solutions AS. "The production designers didn’t want the ubiquitous supersized LED or projector screens, they wanted something different. In addition the producers wanted to have as many people in the audience as possible. In order to do this they needed a 360 degree stage." This presented a considerable challenge - how to create enough variety in the background image for the TV cameras to work with. Lighting designer, Anders Busch, discusses: "We believed that by combining the audience with vibrant lighting we could use them as a dynamic background element in the picture. This approach significantly reduced the number of seats we had to loose. However we could still achieve the dramatic effect we were looking for. In the end we positioned the fixtures in between members of the audience. I wanted a punchy compact fixture that could deliver the high impact I was looking for without taking up too much space. The choice was simple; for me the only fixture that could work for this effect was the Clay Paky Sharpy. Punchy and compact, it was perfect for a production like this." In the end the show lost even fewer seats than Busch had expected. Because of this the production looked a lot bigger than it really was as he explains: "I felt I was going to need at least 200 Sharpys to get the look I wanted, however as soon as I started to draw the production in Wysiwyg in order to test the camera angles I realized that I could do the whole job with just 80 units!" The show was also very quick and easy to rig and set up as Nilssen describes: "Because the Sharpy features an onboard battery it’s easy to programme the address and mode without having to power them up and before we start rigging them. This means we save a lot of time and energy on site. Plus, because they are so lightweight, we only need one rigger to handle the fixtures - whether we’re rigging on the floor or in a truss." Today the Clay Paky Sharpy is considered by many in TV and rock to be the ‘must have’ lighting fixture and Nilssen bears this out: "The Sharpy is now the best selling luminaire I have at Eletrik Solutions AS. We’ve had consistent success with it primarily because as Anders says: it’s lightweight, great value, easy to work with and has a tremendous light output that beats everything else out there!"